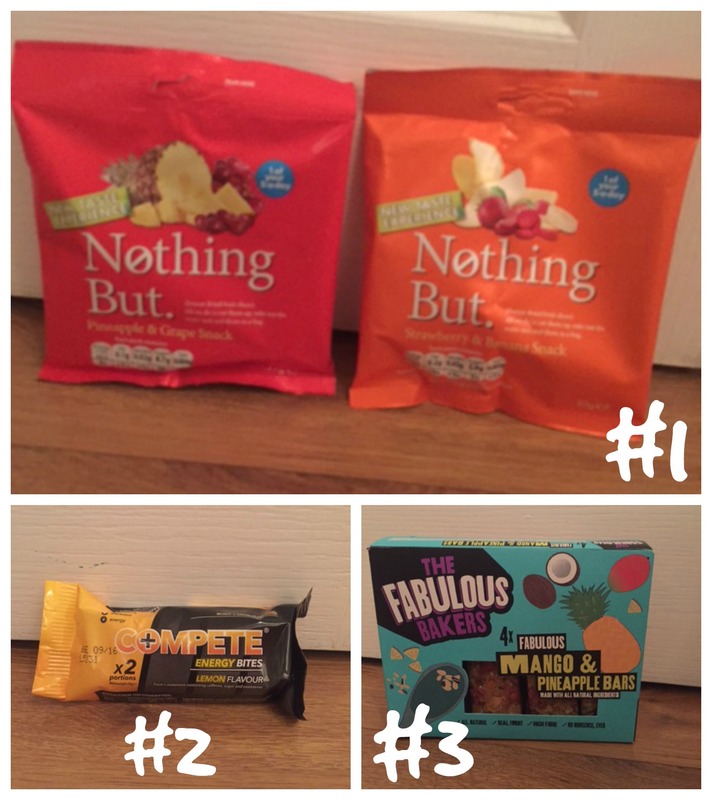 #1 Nothing But, a healthy freeze dried fruit and vegetable snack, all under 80 calories and no added…. anything! And one packet will count towards 1 of your 5 a day! I loved those i am a huge fan of dry fruit and really enjoyed them they could only be slightly bigger so i can enjoy more of the taste inside! #2 COMPETE® Energy Bites are delicious, low calorie chocolates infused with caffeine (1 bite = 1 large premium coffee). COMPETE® Energy Bites provide an instant boost to help improve your alertness, endurance and physical energy. Recommended to take five minutes before physical exercise, driving, partying or studying. Now i am not a huge fan of coffee or energy bars so this wasn’t for me but with Mr. C. currently cycling into work each morning i made him my ginnypig and let him test it for me. #3 The Fabulous Bakers brought out a brand new box full of delicious Mango & Pineapples bars. Made with all natural, honest ingredients, the bars contain no nastiest or added sugar. They’re made with real fruit, slow release energy oats and they’re high in fibre too. taste more oaty then fruity. 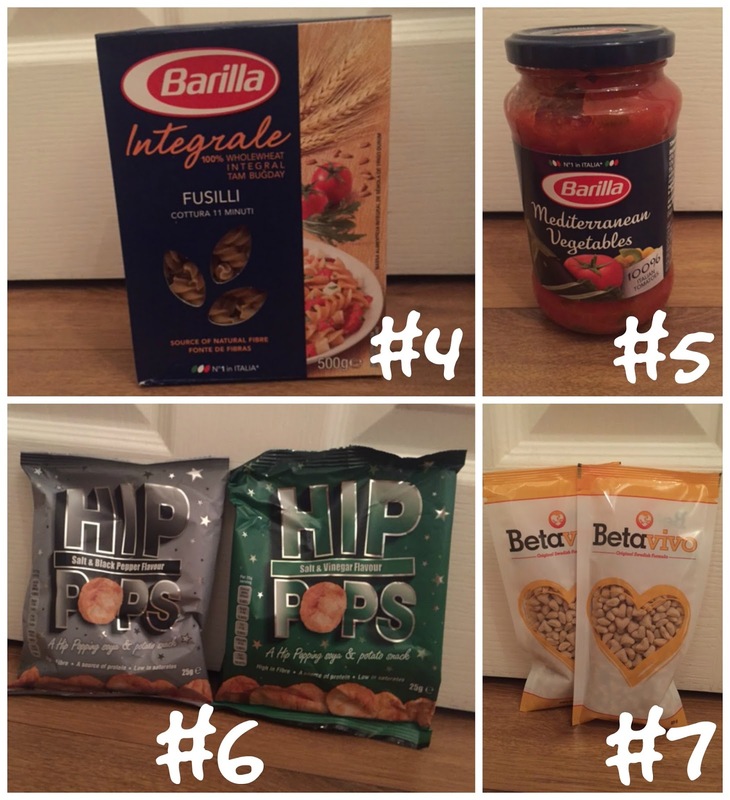 #4 Made in Italy with carefully selected durum wheat and unmatched passion for eating well, Barilla is Italy’s No. 1. Just one serving of Barilla Whole-Wheat Fusilli gives you 20% of your daily fibre needs, essential for body balance. #5 Barilla’s Mediterranean Vegetables sauce is a delicious combination of 100% authentic Italian tomatoes, ripe courgettes, plump aubergines and sweet peppers, capturing the true flavour of the Mediterranean. With no added preservatives, Barilla’s Mediterranean Vegetables pasta sauce pairs perfectly with our whole-wheat fusilli. I cooked up a nice pasta and sauce dish (with some added bacon) for the kids the other day and even though we are mostly eating white pasta i decided to mix it up a little bit because it was really tasty and the sauce was delicious and full of flavours! #6 Hip Pops are a healthier snack when compared to similar fried or baked snack products, typically 50% less fat than standard potato crisps on average! They come in 6 great flavours, 4 of which are gluten free! This product is less than 11% fat, low in saturates, and it’s “Hip Popalicious”! and i had some off the salt and pepper flavour which was a tad too peppery for my taste but i agree with the lightness and double the layer crisps comment of my OH i am eager to try out some of the other 4 flavours now! #7 Betavivo is a crispy oat heart cereal which is proven to lower your cholesterol and blood glucose. One daily serving of Betavivo provides the required 3g of beta-glucan from oats needed to reduce your blood cholesterol as well as helping to reduce the amount of blood glucose your body produces. I added some of the oat heart cereal into my morning cereal bowl but i have to admit i didn’t enough eating it unfortunately its too hard for my taste (might make a good overnight oat bowl though) and a bit tasteless. #9 Crabbie’s Alcoholic Light Ginger Beer focuses on the unique attributes of our much loved Original Ginger Beer, whilst offering a lighter drink that you can enjoy for longer. Drink straight from the fridge or pair with a spirit of choice to create your own delicious home cocktail. Mr. C. is a massive Ginger Beer lover so he tested this for me and said it has a smooth ginger flavour without a sharp aftertaste which sometimes comes with drinking ginger beers. 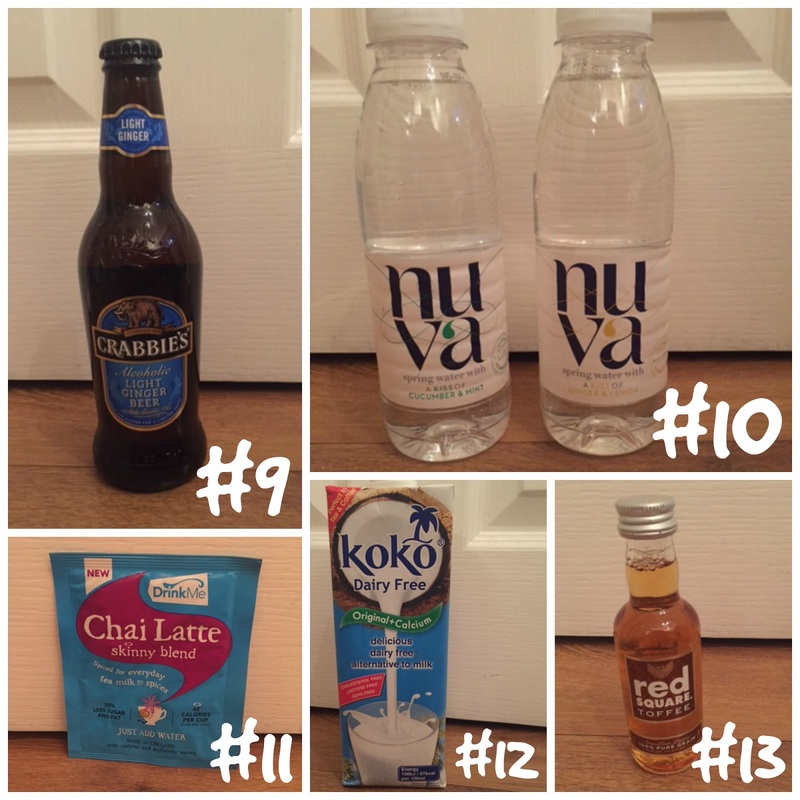 #10 Nuva is a new generation drink of delicate spring water with a kiss of natural extracts and flavours with no sugar, no sweeteners and no preservatives. I had the Ginger&Lemon and Cucumber&Mint flavours to try but i could only taste out the Ginger flavour out of those and was a tiny bit disappointed that i couldn’t taste more! #11 Drink Me Chai’s award winning Spiced Chai is the original flavour that was inspired by Amanda Hamilton’s travels to India. A blend of exotic spices, milk and sweetened tea the product is a just add water or milk for that taste of India in an Instant! I am not a huge tea drinker but i given it a go and it was nice and defiantly warmed up my belly! The other week i had some german friends staying who’s little 3year old girl cant drink normal milk in the evenings because it makes her stomach upset to she had a bottle of the Koko Dairy Free Original and her verdict was: “very yummy”! #14 Red Square Toffee is made with 7 times distilled and 100% pure Vodka made for sharing, mixing and making the drinks that bring people together. I decided to keep this one for my next cosy dvd night in as my special tipple but i did unscrew the bottle and had a taste and loved it! Overall we liked 7 items out of the 14 in the Box which is half of the contents so this box didn’t really get my taste buds going but i am more then sure some of my more healthier living friends would enjoy this i just have this sweet tooth which i love too much to give up (just yet). 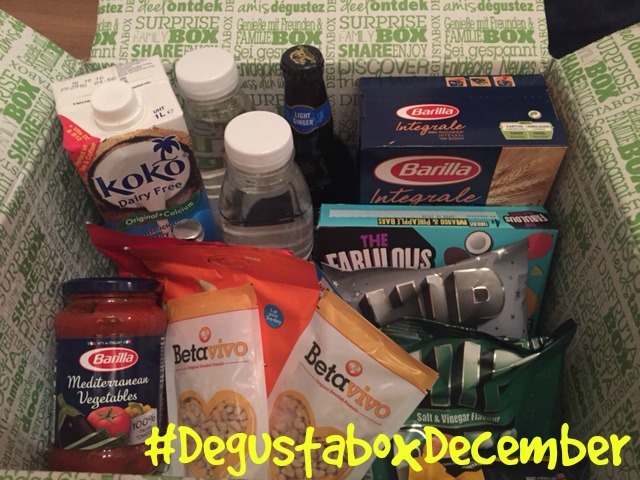 Disclaimer: I have been sent the December Degustabox for reviewing purposes, but all thoughts and opinions are mine.